A third of Kentucky’s spring practice is officially complete following this morning’s action inside Nutter Field House. After practice Brad White and a few new faces on the UK defense met with the media. Jon Sumrall hasn’t been on campus long, but he’s already turning heads. If you’re near the field, you can probably hear Sumrall. Once practice ends, there’s not much voice left to hear. The new middle linebackers coach will often end up running alongside his players as they go through drills. Sumrall’s energy is a refreshing surprise, and not just for the true freshman. “That guy’s gotta screw loose,” said sophomore linebacker Jamin Davis. Davis and Wilkins are the two least experienced players in Sumrall’s inside linebacker room. Aside from Jordan Jones, Adrian Middleton and Josh Allen, the rest of Kentucky’s front seven returns in 2019. One new addition is defensive tackle Isaiah Gibson. As the coaches like to say, he’s one of many new guys “swimming” as they install the playbook. While Gibson learns Kentucky’s defense, the three-star recruit from Springfield, Ohio has received a ton of help from Calvin Taylor Jr. In the middle linebacker room, Wilkins has received plenty of help from DeAndre Square and Chris Oats, but they could not prepare him for the speed of the game. There was one guy we’ve seen quite a bit of lately. This time Josh Paschal wasn’t just talking about beating melanoma. He’s focused on returning to form. Entering last season, White believed Paschal could play near the same level as Josh Allen. Paschal believes with a little bit of time he can not only get back to that level, but surpass it. When Jared Casey flipped his commitment from the University of Oregon to the University of Kentucky, he instantly became one of the biggest names in the Cats’ incoming recruiting class. Plus, he’s from right here in the Bluegrass State (Louisville, no less) and has relatively-high national rankings, meaning he’s only continued to move up that list. Casey was ranked as a four-star prospect by all of the major recruiting services, and Rivals lists him as the No. 15 outside linebacker in America. He finished his senior season at Ballard with 70 tackles, 15.5 tackles-for-loss, three sacks and one forced fumble in 11 games. There’s no rest for the weary – instead of enjoying his last semester of high school, Casey became one of nine players who enrolled at UK in the spring to start working out and practicing alongside his teammates. Maybe you knew all of that already. Now, you can learn a little more about the incoming freshman, thanks to our friends in the UK Athletics media department. In his intro video, Casey reveals who serves as his biggest influence (on and off the field), why he chose to enroll at UK a semester early and what made playing for Kentucky the best choice for him. Sounds like a heck of a plan. Get on board, BBN, because Jared Casey means business. Brad White has been described by many as a tactician, but what exactly does that mean? KyWildcatsTV mic’d up UK’s new defensive coordinator at spring practice to paint a clearer picture. It’s odd not seeing Josh Allen rushing the passer, but it’s encouraging to see Josh Paschal attack the backfield. One newcomer makes a few appearances: Jared Casey. The four-star linebacker from Louisville has good and bad moments. You’ll be pleased to see how White responds to the latter. White and the rest of the Kentucky football team will practice Thursday and Saturday morning to wrap up week two of spring ball. You only need to take one look at Kentucky’s wide receivers to notice a difference in the group. That’s right, Lynn Bowden cut his hair. Offensive coordinator Eddie Gran is trying new things with Lynn this spring. “Lynn’s having a really good spring. We’re finding ways to get him the ball. He’s lining up all over the place. He’s really smart,” said Gran. No matter how creative the UK coaching staff gets, they have to find more options at wide receiver. Wide receivers coach Michael Smith believes they’ll get there in due time. “They’re coming along,” Smith said. “The first four days I’ve been really impressed with what Bryce Oliver has done. I think Marvin Alexander has shown he has a chance. For the guys that we didn’t see a lot last year, Akeem (Hayes) coming back, playing a little bit. Not that he’s a young guy, Clevan (Thomas) is back in the mix and doing some good things. I thought as a true freshman just coming in, I thought Demarcus Harris showed he’s going to be in the mix. And Allen Dailey, Allen Dailey is solid. He played on special teams last year, but he’s doing some good things. Ali and Epps have been the names mentioned most over the first four practices. Challenged before the start of spring practice, Epps’ top priority is turning close misses into deep completions. He did just that at least once this morning. The former five-star offensive tackle is back in action after he was sidelined for a season with a knee injury. Seeing the glass half-full, he prefers to call it his redshirt year. There was one incredible downside to missing last season. Landon talked at length about his return to the field and the rest of the UK offensive line. He mentioned that Darian Kinnard has almost exclusively played tackle, an interesting twist after spending his freshman season at guard. Young also looks more enormous than ever before. Many of the Wildcats went home or took a vacation during UK’s Spring Break. Not Terry Wilson. The quarterback stuck around Lexington for a week. “I just didn’t feel like going out and spending a bunch of money and stuff like that, so I decided to stay around here,” Wilson said. I appreciate his honesty. Most QBs would give some BS about wanting to be a leader, yada yada. Nope, he’s just a frugal man. I respect that. KSR’s Monday Night Football Notebook: Three Future New York Jets? As Kentucky’s future NFL stars prepare for Pro Day, Avery Williamson has returned to Lexington to train alongside the Wildcats. This afternoon the New York Jets’ linebacker posted the picture above with Benny Snell and Josh Allen. Could they all end up New York City next season? The Jets currently hold the No. 3 overall pick. Even though we’re currently in the doldrums of draft season where every mock drafter is trying to be cute (the amount of trades and the disparity across the board is ridiculous), many still believe Allen will be taken after Kyler Murray and Nick Bosa with the third overall pick. As for Benny, seeing another Snell in a Jets uniform got a lot more complicated once they signed Le’Veon Bell. However, Bell could use a bully behind him. After cutting Isaiah Crowell and letting Bilal Powell walk, Snell could be worth a fourth round pick. That all may be a stretch, but we should receive more clarity as to who is inquiring into all of the Wildcats at the end of the week. Expected to be the most star-studded UK Pro Day since Mike Tomlin and Joey Porter attended Bud Dupree’s Pro Day, Friday morning is going to be a great day to make some money. While you’re focused on the fallout from Kentucky’s NCAA Tournament first round win, I’ll be at the Nutter Field House soaking in the entire experience. Expect your first updates on KSR around noon. Mike Edwards will not be participating, but he’s almost ready to run. April 8 is UK’s second Pro Day. Edwards will be accompanied by C.J. Conrad. The UK tight end learned today he’s been cleared to return to football and we could not be more ecstatic. Speaking of Wildcats in town, Za’Darius Smith celebrated his $66 million deal in the Bluegrass. The Green Packers’ defensive end kicked it with Vince Marrow just a few days after putting pen to paper. Seeing Big Z make it big time is incredible. It feels like just yesterday he was teary-eyed on top of a billboard. Smith will wear No. 55 for Green Bay, an homage to his former Ravens’ teammate, Terrell Suggs. Randall Cobb to the Cowboys? The slot receiver has spent the first eight seasons of his NFL career with the Green Bay Packers. He might go from one of America’s teams to the other. The free agent is reportedly meeting with the Cowboys today to potentially fill the hole left by Cole Beasley. America’s No. 1 Cowboys fan, Drew Franklin, cannot contain his excitement over the news. Kentucky is one of 29 schools to make a bowl game and the NCAA Tournament this year. Of those 29, only three teams have done that for three straight seasons: Virginia Tech, Michigan and Kentucky. Not too shabby. And he still hasn’t missed a field goal. UK’s all-time leading scorer is 5-for-5 through three games. This week the Memphis Express signed Johnny Manziel. The 1-5 team desperately needs some offense and Johnny Football is the perfect person to inject some energy into the franchise. He started practice today and should get the start this Sunday when Memphis hosts the Birmingham Iron at 8:00 p.m. ET on the NFL Network. It should be a nice little nightcap after a weekend of March Madness. Before we meet them face-to-face, UK Football is profiling each new early enrollee throughout spring practice. Defensive tackle Isaiah Gibson was one of the first to get the nod. There are still quite a few more to get to, including his high school teammate, Moses Douglass. The Kentucky tight end hit a speed bump on his way to the NFL. Luckily, tests proved it was just a small hurdle. At the NFL Combine doctors discovered an abnormality in Conrad’s heart. He was immediately sent home and sidelined from football activities until further tests could be completed. After receiving a second opinion, C.J. had some good news to share. Conrad will have a few weeks to train before he competes with Mike Edwards at UK’s second Pro Day. We’re all grateful C.J.’s time on the football field is not yet finished. A special thanks to all of the Kentucky fans who saw him on tour with Josh Allen last week. When life dealt him a bad hand, the BBN had his back. Isaiah Gibson, one of nine early enrollees for Kentucky’s 2019 class, sat down with KYWildcatsTV to give the BBN a chance to get to know him a little bit better. Gibson, a 6’4 300 pound prospect from Springfield, Ohio, chose Kentucky because of the relationship he has with Mark Stoops and the rest of the coaching staff. Gibson, and fellow early enrollee Moses Douglass went to the same school, and have similar attitudes. BBN, give Isaiah a warm welcome to Lexington! As the first wave of NFL free agency has come & gone Randall Cobb is still without a job. For a veteran receiver like Cobb, who played in just nine games last season, this should not be surprising or disappointing as the beginning of free agency is full of chaos with an urgency to sign the top players quickly. Cobb, 28 years old, is in a position where the best strategy is to let the market work itself out, see what kind of deals other receivers get, and find the best possible landing spot for himself & his family. Now that Adam Humphries signed with the Titans and Cole Beasley with the Bills, Cobb is the best slot receiver still available in free agency. So what teams are in need of a slot receiver? The most frequently mentioned option has been the New England Patriots , as they reportedly attempted to trade for Cobb during the 2018 season, but I am not so sure. On paper Cobb does fit the offense, but Belichick cherishes his compensatory picks, and signing Cobb would count against New England in the compensatory-pick formula. Following a few recent transactions I believe the most likely landing spots for Cobb would consist of the Baltimore Ravens, Kansas City Chiefs, and the Dallas Cowboys. Each team could fill their need of a slot receiver through the draft but if they chose to do so through free agency Cobb is the best option. In terms of a contract, Cobb is hoping for a 2 year deal with around 7 million per year. Currently, the former Kentucky star does not have any visits planned, and it could stay that way until after the draft. For Cobb there is no particular rush to get a deal done, ultimately the franchise he chooses is much more important than the timing is. PHOTO: Is Za’Darius Smith a demon? 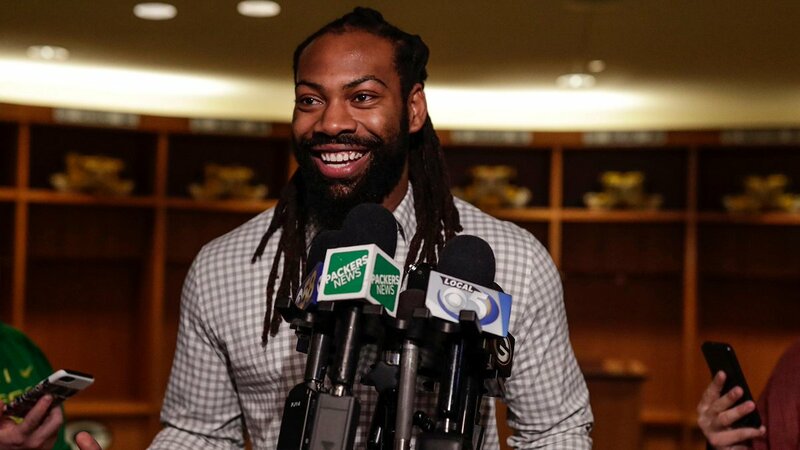 Za’Darius Smith is back in Lexington after signing his four-year, $66 million contract with the Green Packers. While in Lexington, Smith spent time with his former coach, Vince Marrow. Smith posted the following picture of the two on Twitter. The horn placement on this picture could not have been better. You couldn’t even plan it and get a perfect alignment like it is. So, do we think Z planned it or is he just a demon? Always great to see former Kentucky players come back to Lexington. And, it is especially great to see them spend time with former coaches and teammates. Best of luck to Z in Green Bay! Football’s spring season is generally all about work happening outside of the public eye. Fans know the team is practicing, but aside from the Blue/White game, it’s hard to know exactly what they’re doing. Thanks to KyWildcatsTV, we get a clearer picture of what’s happening around the Joe Craft Football Training Facility. While the Cats are away on spring break, UK released footage of Michael Smith from the first week of practice. The wide receivers coach is mic’d up as he instructs Isaiah Epps, Lynn Bowden, Josh Ali, Bryce Oliver and more. As you’ll see, the primary focus during the spring season is on the little things. The biggest takeaway from the video: Lynn Bowden is a big shorts guy. Four former Kentucky Wildcats on the verge of starting a career in the NFL will all gather in the Commonwealth for one night only. Lonnie Johnson, Mike Edwards, Darius West and Derrick Baity will be signing autographs Saturday March 23, the day after UK Pro Day, at Frank Shoop in Georgetown, beginning at 2:00 pm. Unlike Benny Snell, Josh Allen and C.J. Conrad’s stops, this is a private event. 150 tickets will be sold in advance for $75. Each ticket will get you signatures and a picture with all four players. You cannot show up on the day of the event, but you can click here to meet the four who helped Mark Stoops bring DBU to Kentucky. Get your tickets before they’re gone. Blaylock and his twin brother Zack played at Kentucky from 2012-2015. During his career, the outside linebacker played in 23 games and recorded 46 total tackles, 21 solo. If you remember, the Blaylock twins are the sons of former NBA All-Star Mookie Blaylock, who is currently serving 15 years for vehicular homicide. Daron and Zack’s younger brother Dominick is a four-star wide receiver who recently signed with Georgia. Blaylock now resides in Atlanta, where he works as a recruiting specialist for a business and technology consulting firm. Until he skyrockets to reality TV fame, of course. For more on Season 15 of “The Bachelorette,” including who the leading lady will be, click here. In what seems to be a monthly occurrence at this point, the FBI has uncovered yet another scandal in the world of college athletics. This time, however, the large-scale scheme involves cheating on college entrance exams, ultimately helping students get admitted to elite universities. According to the report by NBC News, the scandal involved students being recruited to schools as athletes, regardless of their athletic abilities, ultimately lowering the bar for incoming students to get into prestigious schools. The schools involved? Georgetown, Stanford, UCLA, San Diego, USC, Texas, Wake Forest, and Yale, according to federal prosectors. As of right now, at least 49 individuals have been indicted as a result of the nationwide admissions cheating and recruiting scheme. And yes, some of those individuals are current and former Division-1 coaches including: Stanford sailing coach John Vandemoer, Yale women’s soccer coach Rudy Meredith, Georgetown tennis coach Gordon Ernst, several USC coaches, UCLA men’s soccer coach Jorge Salcedo, and Texas men’s tennis coach Michael Center. BREAKING: The US Attorney in Boston has unsealed indictments against at least 47 people in a nationwide college admissions cheating and recruitment scheme, including current and former D-1 coaches at Yale, Georgetown, USC, Wake Forest and Texas. According to the same report, actresses Felicity Huffman of Desperate Housewives and Lori Loughlin of Full House (c’mon, Aunt Becky) are also involved, with each being charged with conspiracy to commit mail fraud and honest services mail fraud. The bribes reportedly ranged from a few thousand dollars to up to $6 million. There is a press conference scheduled for 11:30 a.m. ET, where more details of the scandal, including more names involved, are expected to be announced. Hello, Kentucky football fans. In the middle of the two most exciting college basketball weeks of the year, I’m sure many of you worried football news would slow to a trickle. Fear not, there’s still plenty of football to discuss. Unfortunately, none of it is spring football. The team has the week off for spring break. While the players are away, Stoops made a move that could change the trajectory of the program over the next five years. That’s not something you can typically say about a new quality control coach, but that’s what Mark Perry brings to the table. This morning Football Scoop reported UK has added two new quality control analysts. Joe Scola will reportedly work with the defense and Mark Perry will assist the offense. The breaking news stories noted each person’s history at the University of Kentucky — Scola previously served as an administrator and Perry played quarterback at UK — but the story behind the story is why the move is so significant. Last year Perry served on Neal Brown’s staff at Troy as Director of Football Operations. The former UK quarterback played with Brown under Hal Mumme in the late 90s. In January, Perry agreed to follow Brown to West Virginia to serve as the Director of Football Administration. Stoops used a quality control vacancy, a more hands-on job that digs deep into the X’s and O’s for a football program, to convince Perry to come home. At this point, you’re probably asking, “Why should I care that Stoops swiped one of Brown’s administrators to be a quality control coach?” Sure, there’s a nice revenge factor after Brown’s first West Virginia commitment came from Danville, but that’s not why Perry’s addition is a big deal. Before Perry entered the world of college football, he was a Kentucky high school football coach for 14 years. In his final year as Lexington Catholic High School’s head coach, Mark Perry’s starting quarterback was Beau Allen. Fast forward two years, Allen is a four-star prospect and the No. 15 pro-style quarterback in America according to Rivals. This move is just the latest card Stoops loaded into his deck to land Allen. To start, Beau is a legacy recruit. His father, Bill, was a reserve quarterback in the 80s for Jerry Calibourne. Continuity is key too. Since Kentucky offered Allen in May of 2017, the Cats have kept the offensive staff intact. When Eddie Gran turned down Georgia, it helped the Allen-to-UK momentum. All of those good Kentucky vibes around Allen entered shaky ground once Brown accepted the head coaching job at West Virginia. Less than a week after Brown took the Country Roads to Morgantown, Allen had a scholarship offer from West Virginia. You’ll never guess who told Beau he had the offer. Football recruiting is not for the faint of heart. Neal Brown is a nice guy, but Stoops is from Youngstown. You do not mess around with a guy from Youngstown. Brown won an early battle in this recruiting war, a war Stoops is willing to use big guns to win. Criticized for being unable to successfully recruit an elite, program-changing quarterback, Stoops went so far as to swipe one of Brown’s staffers to prevent Allen from leaving Lexington to play college football. Will this move secure a commitment from Allen? Only time will tell. Ultimately, I believe much of it will depend on how Terry Wilson and the UK offense develops this fall. Allen plays in a spread system at Lex Cath. If the pocket-passer chose to play in an Air Raid system, instead of the Benny Snell power run offense, you could not blame him one bit. Stoops has done everything to cultivate the ideal environment for Beau Allen. Developing the offense is the final piece of the puzzle. Today Stoops proved he’s willing to go to great lengths to win recruiting battles. Luckily, he’s not relying on gimmicks. In an attempt to recruit a four-star defensive tackle from Houston, Arkansas head coach Chad Morris offered scholarships to Vernon Broughton Jr.’s eighth grade cousin and fifth grade brother. Sorry kids, I prefer to see parents in pads on recruiting visits. C.J. Conrad will be sidelined as he undergoes further medical evaluation. Mike Edwards will wait until April 8 to undergo combine workouts. The safety is still recovering from a broken thumb he suffered in the Senior Bowl. UK Pro Day probably won’t be your top priority just hours before the first round of the NCAA Tournament tips off. KSR will have you covered with plenty of coverage from the event and a little football podcast from KSBar once the action concludes. If you’re lucky, we’ll have a special guest or two. With a little help from KyWildcatsTV, you can see all of Allen’s best moments from the Bednarik Award ceremony that happened last weekend in Atlantic City. Known at UK as C.J., the former UK defensive tackle went viral when the CFL announced “Poop Johnson signed with the Argonauts.” How much traction did it pick up? TMZ is now reporting the one-time KSR Pregame Show host has inked an endorsement deal.